According to the media release, CFMEU Pulp and Paper Workers District federal secretary Alex Millar said the launch of the billboards coincide with the postcard writing campaign which is being supported by thousands of pulp and paper workers. “Workers in the pulp and paper industry don’t want charity, they just want to see sensible policies put in place to ensure the ongoing viability of this important industry,” Mr. Millar said. 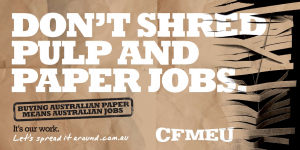 As part of CFMEU’s ‘Let’s Spread it Around’ campaign, thousands of pulp and paper workers signed a petition demanding politicians from both parties to support procurement policies that will give Australian manufacturers of paper products a fair chance to compete with imported products. Last month CFMEU wrote to political party directors furnishing them a list of Australian made paper products and asking them to signify their commitment to using Australian made products. In turn CFMEU promised to publish the full list of candidates and parties that will commit to using Australian made paper products. Mr. Millar said the Union was given a confidence boost by the Government’s recent support for the automotive industry but also hopes other industries would be given similar support. “The way governments choose to spend their money is a simple, yet highly effective, technique to provide essential long-term sustainability to local manufacturing industries,” Mr. Millar said. The Government is the biggest purchaser of paper in Australia but several incidents have been uncovered pointing to some government offices choosing to go with imported paper products despite the competitive price of locally made products. “Our union is working with pulp and paper workers around the country to seek bi-partisan support for improved procurement and standards policies to allow Australian manufacturers of paper products to compete with imported products on a level playing field,” he said.